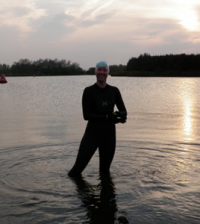 Sportsister catches up with Olympic Medalist and World Record holder Jo Jackson as she prepares for the swimming World Championships in July. She talks about her motivations and inspirations, and her mission to get more people to dive into swimming. Firstly, congratulations on your success at the British Swimming Championships, how does it feel to be a World Record holder? Pretty cool actually! I’ve got back into hard training now because I’ve got the World Championships coming up in July and hopefully I can swim well there, but it’s really good to get a good swim under my belt before then. Breaking a World Record is just a massive bonus for me! What means more to you, your Olympic Medal or World Record? I don’t know really – they’re both really different. I never in my life expected to get an Olympic medal so it’s really special to me, but to break a World Record is totally different. It was just absolutely amazing, I never thought I’d be able to achieve something like that. Your team-mate Rebecca Adlington has admitted to struggling with the weight of expectation after Beijing, have you experienced the same pressure? No I don’t think so. Obviously there will be a bit more pressure on me going into the World Championships, a lot of people will be expecting things. But I can just let that go over my head and the only pressure I really have is from myself. I’m just going to go out there and hopefully do as well as I can. All the women who did well in Beijing have inspired lots of other young people to get involved in sport. How do you feel about being a role model? It’s absolutely amazing! 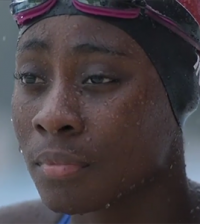 There’s so many more people now taking up sport, especially women, and there’s even more people starting swimming. There are loads of campaigns out there to get people swimming, and I think that’s really good for the sport, and its also good for them as it’s getting them healthy and fit, which is a big benefit. How do you feel about the media coverage swimming receives in Britain? Oh it rubbish! It’s probably one of the worst covered sports ever! It is getting better since the Olympics; we did have people watching our World Championship trials in Sheffield. It is really sad that not that many people know about it – I think that is something that both our swimmers and British Swimming need to sort out, and plug swimming more to get people involved because it is a great sport and it is a really enjoyable thing to come and watch. It will take time, and maybe it’ll be after I finish swimming, but hopefully we can start to increase the demand for it so it gets more advertising and more people come to watch. Obviously you’re preparing for the world championships, is there anything specific you are doing? At the moment I am just carrying on what I’ve been doing. I’ve been doing a lot of meterage in the water, and I’m doing a bit more gym work like running and biking, but I’m kind of just carrying on from what I was doing and hopefully I can keep on swimming well and making the fast times carry on into the World Championships. After then we will see how things go and we might make a few change. At the moment things are just going really well how they are. What proportion of your training is swimming compared to other and based training? Well I do about 25 hours in the pool a week and about 8 hours on land – including weights sessions, running and biking. So it varies really but the majority of it is the swimming part. Is that all year or does that vary from winter to summer? Yeah it does vary, especially at the start of the season in September/ October after we’ve had a little break, we do a lot more running and biking and probably lot more meterage in the water, and that’s also the same after our trials which we did in March time. After we’ve done all the aerobic stuff we’ll move onto the more anaerobic stuff – doing more sprinting etc and cut back on our distance work on the lead up to events. Do you prefer to swim in relays or individual events? I love swimming in relays they’re so much fun! I love being a part of the 4 x 2 relay its absolutely amazing, just the buzz we all get from each other is great. But then, it’s the individual events that I have swam really well in so far, and its in these events that I have got most of my medals – so its that feeling of getting in there and doing it for yourself and that achievement for yourself. They are very different, it’s great to stand behind the block with four girls cheering each other – like at the World Short Course where we got the silver medal, it was absolutely amazing to be there with the four girls! They are both really different but they are both really special. It is really because of my sister to be honest. I learnt to swim when I was younger like most children, and then started a club when I was nine or ten. I used to go and watch my sister train and because she was doing it I wanted to do it too it just carried on from there really. In your opinion are champion swimmers made or born? Loads of people don’t believe me when I say I’m not a naturally talented swimmer! Some people can get in the water and naturally swim great, but it took me a lot of years to get the technique and swim well. I wasn’t a 12 year old with national medals, it took me until I was 15 until I started winning at nationals and it was a lot of hard work for me – I had to get the technique right before I could swim well. Some people think that if they’re not naturally gifted they’re not going to be very good at it, but that’s not true. If you put in a lot of hard work and determination in to it then you can be good at something. When you’re doing 24 hours worth of lengths in a week how do you keep yourself motivated? I think when I’m swimming well and doing as well as I can that motivates me. Especially when I broke the World Record, the buzz I got from it makes me want to work hard and try and do it again and carry on breaking records. seeing Becky [Adlington] at the Olympics getting two gold medals motivated me to want to do better than I did out there. Obviously you do have tough times when you don’t swim well and training is hard, and then you do struggle, but then you get in and do a good set and the motivation comes back. Do you have any tips for our readers who swim just to keep fit and need some motivation to get up and go to the pool before work? The main thing is to enjoy it, because if you don’t enjoy it your not going to want to get up and get in. Sometimes it’s good to go with a friend, because you’re not going to drag yourself out of bed early to go on your own when there’s no one to motivate you, but if you know your friend is going to be there you get yourself up. You can have fun and can chat as well. Swimming is a good sport for that as you can stop at the end of the pool every few lengths and have a chat. Swimming it tough on skin and hair, do you have any secret beauty remedies to share with our readers about keeping their hair and skin looking good after hours in the pool? Moisturiser! I moisturise with coco butter after every session and I also use leave in conditioner after every session – it does make it feel better, but no matter how often you wash your hair it always smells like chlorine – you cant get rid of the smell! So who is your hero, who inspires you? When I fist started swimming it was my sister that inspired me, if it wasn’t for her I wouldn’t have started at all. Watching her swim, and she did so well, I wanted to do the same. In the swimming world its people like Michael Phelps – because they’re so talented. To win as many gold medals as he did – well everyone wants to be like that! You appeared on a Question of Sport last week, how was that? It was so much fun – I had the best time ever! I was on Matt’s [Dawson] team and he was so nice and friendly, he really helped me because I was so nervous! Have you had many opportunities to do TV? I’ve been doing a few bits. I’ve been doing some campaigns for swimming; I did one at the weekend for Schweppes Abbey Well and their ‘Get Britain Sch…wimming ‘campaign. They are encouraging more people to get active by offering free swims on Mondays at over 400 pools, and for every free swim redeemed they will donate £1 to different swimming projects around the UK. 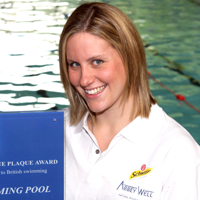 – especially when they’re giving free swims away, it makes people want to go to their local pool and maybe get into the sport. Sportsister wishes Jo good look with the world championships, we’ll be following all the action!